Johnson Manor is a new active lifestyle community located in Mooresville, North Carolina. Benchmark Communities is building the 114 attached and single-family, low-maintenance homes near Lake Norman. Anchored by a clubhouse and centrally-located community gardens, residents make the most of the beautiful, natural setting. A clubhouse at the heart of Johnson Manor is the center of recreation and social activity. Residents can maintain a fitness routine using the exercise room. A reading room is an excellent place to enjoy a good book. A meeting room and catering kitchen allow homeowners to plan get togethers and social gatherings. Outdoors, residents enjoy the natural surroundings on the covered patio that overlooks an ornamental garden. Homeowners will have the opportunity to start a vegetable garden using the community garden plots. Walking trails and open space ring the neighborhood. Johnson Manor will consist of 114 attached and single-family homes built by Benchmark Communities. 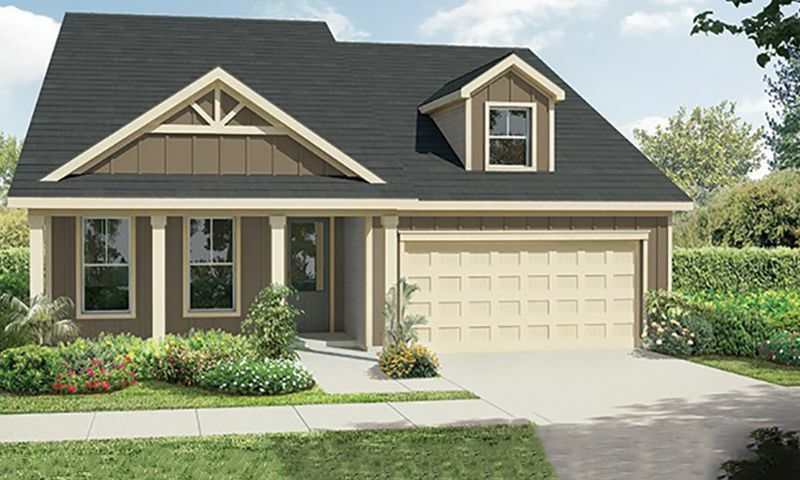 The Duet collection consists of attached homes and will be available in two floor plans ranging in size from 1,473 to 1,655 square feet with three bedrooms, two-and-a-half bathrooms, and attached two-car garages. The Cottage collection, the communities' single-family homes, are available in three floor plans from 1,655 to 1,950 square feet with two or three bathrooms, two bedrooms, and attached two-car garages. Homebuyers can expect granite countertops, stainless steel appliances, and open floor plans throughout the community. First-floor master suites, with generously sized bathrooms, and walk-in closets give homeowners plenty of space. Covered front and back porches allow residents to enjoy the mild and pleasant climate. Residents of Johnson Manor enjoy a relaxed and carefree lifestyle at Johnson Manor. An exercise room in the clubhouse allows residents to stay healthy and active. Social gatherings of all kinds will occur in the clubhouse with its multi-purpose rooms and catering kitchen. Given the mild, year-round climate, many homeowners particularly enjoy outdoor activities. Community garden plots are perfect for growing summer vegetables and socializing with neighbors. Residents can further enjoy the idyllic, natural setting with green spaces and walking trails throughout the community. A homeowners' association will handle exterior maintenance and landscaping, allowing residents more time for the activities they love. Johnson Manor is in Mooresville, NC to the north of the city of Charlotte. Residents enjoy a convenient location with many daily needs just minutes away. A Food Lion lies just across the street from the community's southern entrance. Downtown Mooresville is about four miles away, offering quaint shops and restaurants in a small-town setting. Mooresville is also known as "Race City USA" for the large number of NASCAR teams and drivers based there. Lake Norman is five miles to the west of Johnson Manor and is a popular destination for anglers and boaters. Approximately 30 miles to the south lies Charlotte, the largest city in North Carolina and a center of arts, culture, and entertainment in the region. Johnson Manor is a great active lifestyle community set in the natural beauty of Mooresville, NC. Check back soon for more information on the lifestyle in Johnson Manor. Johnson Manor will consist of 114 attached and single-family homes built by Benchmark Communities. The Duet collection consists of attached homes and will be available in two floor plans ranging in size from 1,473 to 1,655 square feet with three bedrooms, two-and-a-half bathrooms, and attached two-car garages. The Cottage collection, the communities' single-family homes, are available in three floor plans from 1,655 to 1,950 square feet with two or three bathrooms, two bedrooms, and attached two-car garages. 55places.com is not affiliated with the developer(s) or homeowners association of Johnson Manor. The information you submit is distributed to a 55places.com Partner Agent, who is a licensed real estate agent. The information regarding Johnson Manor has not been verified or approved by the developer or homeowners association. Please verify all information prior to purchasing. 55places.com is not responsible for any errors regarding the information displayed on this website.